While one can quickly get bogged down in the minutiae of the origins of the Bible, it is important to re-member that however the Scriptures were handed down to us, they were (and are) the inspired Word of God. Studying the Bible is a treasure hunt. The more you learn about the Bible, the more you will come to appreciate the elegance, the structure, and the relation-ships between the passages. Even though these writings were originally passed down orally for generations, these oral traditions should not be considered inferior to the written word. The preaching of Christ and the Apostles were oral be-fore they were written down. From Adam to Moses there appears to be little known written Word of God, yet God’s Word was passed down orally for generations. Jesus taught His disciples by His Words and His actions. His teachings were later written down. The writ-ten tradition then took precedence over the oral. There is a school of thought that believes Matthew may have actually written down some of Christ teachings as He spoke. Matthew was a tax collector and as such would know shorthand. 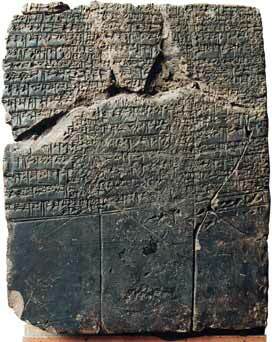 The fact that shorthand was used during that time was confirmed by the fact that in 63 B.C. Marcus Tullius Tiro, a friend of Cicero, had invented a system of shorthand that was widely taught in the schools of the empire. It was used by the notarii (notaries) in the Roman Senate to take down the speeches of the orators. The Greeks also used short-hand for commerce and government. In John 14:26, Jesus Himself said that the Holy Spirit would help transition the oral traditions into written ones. Such was a process that had been going on for generations. … because no prophecy ever originated through a human decision. Instead, men spoke from God as they were carried along by the Holy Spirit. There have been skeptics that believed that Moses could not have written the Torah (c. 1,500 B.C.) because writing was unknown at that time. However modern archeology has given lie to these claims. The Sumerians were adept at writing in about 4000 B.C., and the Egyptians and Babylonians almost as far back in history. More importantly, the Holy Spirit Himself confirmed that Moses could write. Stone – Stone was used as a writing medium in Mesopotamia, Egypt, and Palestine, as is evidenced by the Code of Hammurabi,1 the Rosetta Stone,2 and the Moabite Stone.3 God gave Moses the Ten Commandments written on tables of stone (Exodus 31:18, also Exodus 34:1, 28). During the time of the Book of Job, (2,100 – 1,600 B.C.) 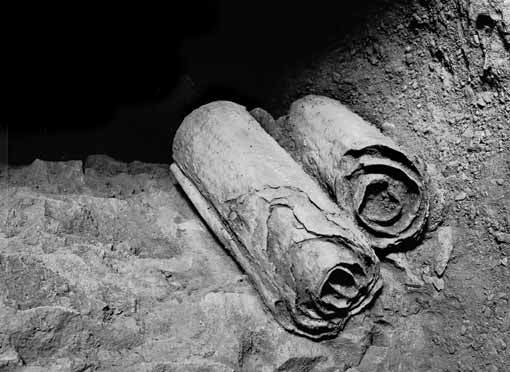 writing was done on both stone and scrolls (Job 19:23–24). He asked for a writing tablet and wrote, “His name is John.” And everyone was amazed. Leather (cowhide) – The Jewish Talmud specifically required that the Scriptures used in public worship should be copied on the skins of animals that were “clean”; in other words, on leather. The scrolls were made by sewing the skins together in lengths ranging from a few feet to one hundred feet or more. The width of the scroll was eighteen to twenty-seven inches high and was rolled onto one or two sticks. Papyrus – Papyrus was made from two layers of papyrus reeds set at right angles to each other, then pressed together to form a sheet.6 The sheets were made six to fifteen inches high and three to nine inches wide. They could be simply used as sheets or joined together to make a scroll up to thirty feet long, long enough to contain the longest epistle. Papyrus was easily obtained, relatively inexpensive, and durable. The New Testament was mostly written on papyrus since it was the most commonly available material for its time. Since papyrus was a plant material, it is not very durable and did not endure well in damp climates. However in the desert climes of the Middle East, they were better preserved. Some papyrus rolls dating back to the 4th century B.C. are still in existence. 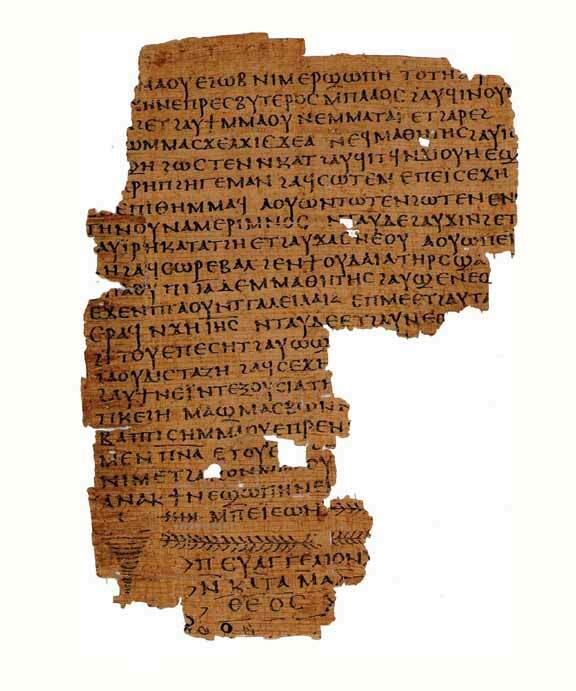 Almost 70 papyrus documents containing parts of the New Testament have been found in Egypt, varying from small scraps like the Rylands Papyrus7 (five verses of the Gospel of John), to the Chester Beatty Papyrus II (consisting of 86 almost perfectly preserved pages containing almost all the epistles of Paul. Vellum (calfskin) or Parchment (lambskin) – Today, the terms “vellum” and “parchment” are used inter-changeably, however, originally, vellum was made from the skins of calves and antelopes, while parchment was made from the skin of sheep and goats. All four types of skins produced a quality writing media that was pre-pared for writing on both sides. Vellum and parchment came into prominence in the second century B.C., eventually replacing papyrus as the preferred media around 300 A.D. Most of the early copies of the New Testament were written on vellum in a writing style called uncial writing. This was a style of writing that was used until the 10th century A.D. when it was replaced by a more cursive script called minuscule writing. Later, the leather pages were bound together into books or “codices.” Over 350 of these codices still exist today, the most important of them being: Codex Sinaiticus, Codex Vaticanus and Codex Alexandrinus. Handwritten texts written on vellum were used as copies of the Bible until the invention of printing, circa 1450. Paper – Early paper, made from wood, rags and grasses began to replace vellum and parchment as early as 900 A.D. in Europe. By the 1400s paper was widely used. The current Biblical texts represent the compilation of thousands of manuscripts (in whole and fragments) in either scroll or codex form. Before the invention of the printing press, the copying of the Testaments was done by hand by people known as scribes, professionals who had a rigid set of rules to assure the text they were reproducing was accurate. During the time of Christ, the Torah had already been copied for more than 1400 years. Yet during that time, on average the scribes had an error rate of less than one out of every 1,580 letters; these errors were usually corrected when new copies were made. Most of these errors consist of spelling mistakes. Sometimes a word form was changed so that it would grammatically agree with the rest of the sentence. It is generally thought that Johannes Gutenberg invented the printing press. In fact, printing had existed over a millennium before. Wood blocks were carved into entire pages containing images and text. These wood blocks were then inked and pressed on cloth and later paper. Samples of this technique from China and Egypt date back to the third century A.D. The technique is still used today. What made Gutenberg’s invention revolutionary was his 1452 invention of moveable type for a printing press. Instead of carving out an entire page of a Bible onto a wood block, individual pieces of wood, each with a single letter carved on it, was placed in a wooden frame and placed in a printing press. Multiple copies of the page were made, then the wooden frame would be broken down and the type reused. This method was much faster that the wood block method and made possible the mass production of Bibles, devotional material, and pamphlets. Gutenberg’s invention also aided the spread of the Protestant Reformation in ways never before imagined. About 180 copies of Gutenberg’s Bible were copied in Latin from a copy of the Vulgate translation of the Bible between 1453 and 1456. Of these Bibles, only about 50 copies are known to survive. Sixty years after the invention of moveable type, about the time Martin Luther posted his “95 Theses,” two dozen printing centers had cropped up around Europe. Within a month of Luther posting the theses, authorized (and unauthorized) copies of his 95 Theses had flooded Europe. Communication methods and media did not change substantially until the 20th century and the advent of contemporary media. Beginning with radio, Christian communication has expanded into every conceivable media. Within the last ten to twenty years, the ways of disseminating God’s Word has exploded. There are websites, mp3 audio files, mp4 video files, podcasts, streaming video, RSS feeds, Facebook® interest pages, Twitter® “tweets,” the list goes on. The greatest challenge for the Christian community of today is to understand, evaluate and eventually embrace the varied technologies available to the contemporary world. 1 The Code of Hammurabi is a wellpreserved Babylonian law code, dating to ca. 1700 BC. It is one of the oldest deciphered writings of significant length in the world. 2. The Rosetta Stone is an Ancient Egyptian stele inscribed with a decree issued at Memphis, Egypt in 196 BC on behalf of King Ptolemy V. The decree appears in three scripts: the upper text is Ancient Egyptian hieroglyphs, the middle portion a more modern Egyptian demotic script, and the lowest Ancient Greek. Because it presents essentially the same text in all three scripts (with some minor differences between them), it provided the key to the modern understanding of Egyptian hieroglyphs. 3. 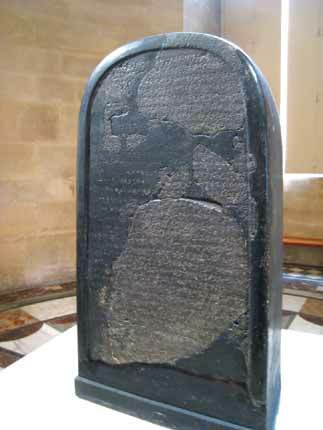 The Moabite Stone is a black basalt stone bearing an inscription by the 9th century BC ruler Mesha of Moab in Jordan. The inscription was set up about 840 BC as a memorial of Mesha’s victories over “Omri king of Israel” and his son, who had been oppressing Moab. It is the most extensive inscription ever recovered that refers to ancient Israel (the “House of Omri”). It bears what is generally thought to be the earliest extra-biblical Semitic reference to the name Yahweh (YHWH). 7. The Rylands Papyri are a collection of thousands of papyrus fragments and documents from North Africa and Greece housed at the John Rylands University Library, Manchester, UK. The collection includes what i s known as the St John’s fragment, generally accepted as the earliest extant record of any gospel. C. The Dead Sea Scrolls Today. Grand Rapids, MI Eerdmans,1994.